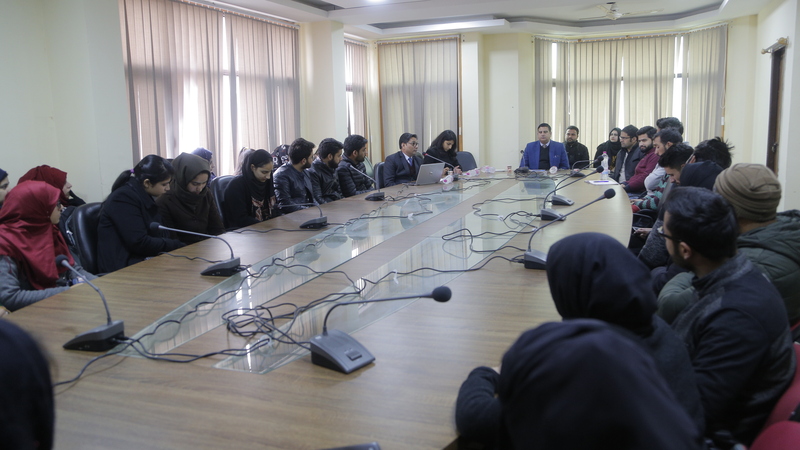 Srinagar: In pursuance of the initiative of placement of Law students in corporate sector, an orientation programme was organized at Nowgam-I, Central University of Kashmir (CUK) as a joint venture of School of Legal Studies, CUK, Department of Law, University of Kashmir and Principal District and Session Judge, Srinagar here on Wednesday. Speaking on the occasion, Dean, School of Legal Studies, Dr. Sheikh Showkat Hussain, apprised the participants about the nature of the programme and mentioned that it is aimed at orienting the students for placement and internship by corporate sectors. He said that until now, the law students in Kashmir have traditionally been seeking jobs in advocacy and judiciary only. “Though at international level corporate sector offers huge avenues. In order to enable our students to benefit from those avenues, an initiative has been taken under the patronization and initiative of Chief Justice, J & K High Court. The program will involve inviting corporate firms for recruiting and internship of law students,” he said. Prof. Mohammad Hussain, Dean Faculty of Law, University of Kashmir gave a brief idea as to how these initiatives were articulated at different levels. Mr. Abdul Rasheed Malik, Principal District & Session Judge, Srinagar elaborated about the importance of this programme and the keen interest that Chief Justice is showing in making it a success. In the first working session Dr. Narender Nagarwal, Senior Assistant Professor, Delhi University elaborated as to how students have to prepare themselves for an interview and in what way they should peruse marketing of their skills in order to get better placements. He emphasized on the fact that preparing for interview needs to be more professional than cosmetic. “The students must concentrate on areas which are specific to the employer and should not exaggerate about their capabilities and nor tend to go to the interviews as if appearing in fashion show.” He further emphasized that the students must anticipate to the expectations of the employer and prepare accordingly. The resource person for the second session was Ms. Anumeha Misra, Assistant Professor, Delhi University. She trained the students as to how they have to draft and formulate their CV’s keeping in view the demands of the market and the expectations of the employer. She asked the students not to confine just on making on CV for every interview but can have multiple CV’s depending upon the specialized field specific to a particular group of employers. The session ended with concluding remarks by Mr. Adnan Sayeed, Secretary District Legal Services Authority, Srinagar.